http://www.indiegogo.com/jimmorphesismonument Click here to donate to help keep graffiti off the mural. This video shows very interesting art restoration – painting conservation steps to recover and reclaim this landmark mural from the 1984 Olympics located in downtown Los Angeles. This was the 1st of 11 Olympic murals to be reclaimed from graffiti and from Caltans’ gray paint. 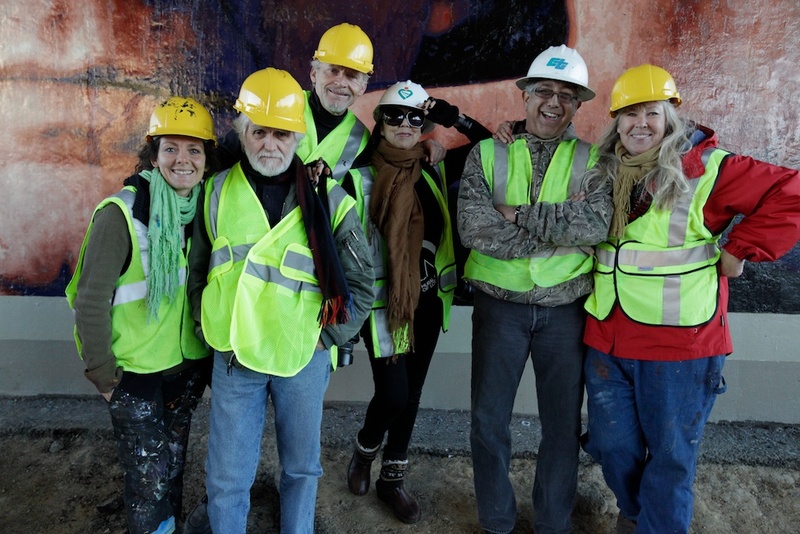 All murals are scheduled for overpaint removal, cleaning and restoration in collaboration with the artists. The goal is to return to Los Angeles this high quality public art gifted in 1984. The funds required for the mural restoration were provided by private donations and The Mural Conservancy of Los Angeles. Generous cooperation from Caltrans was much appreciated. Keep up the good work. Its made me happy to see you keeping the graffiti off the mural! Wonderful issues and murals… you just received a new reader. Keep up the good work with keeping the graffiti off the murals! The tagging will subside once the vandals know we mean business, someone gets caught, we install the video cameras… and then they move on to easier conquests. Thanks for being a part of this restoration team and doing this fine work. Keeping the graffiti is going to be a chore? Great cause Scott. I like those LA Murals on the 101and some on the 5 freeway. I drove past them for 26 years. The murals have been through a lot. Best wishes for success in defending them against the vandals. Thanks for letting us know the inside information about this mural. In our office we’ve been talking about the progress you make on it. Please keep the graffiti off after you get it done. I suppose you know that it will get tagged again? Even non expert people in art know it will get tagged again. Its great to see this mural again. It’ll get tagged again but I suppose you will be hired to keep the graffiti off? Seems that our newly completed job on this mural of Jim Morphesis was rudely covered across the entire lower half with a tag this last weekend. Well, we are on it! Tomorrow morning we’ll take the tag off! Stay tuned… I’ll post a photo for you to see. Honk as you drive by if you love us!